Although many people feel alienated from mainstream politics, they have a hunger for political change. Misguided attempts to “geo-engineer” planetary solutions to potential runaway climate change could have devastating unintended consequences for the environment. The skill of agility – the capability to change plans rapidly, as unexpected developments take on a life of their own. This context is the background for a significant change in a political party that was formed nearly two years ago – the Transhumanist Party of the UK (TPUK). So technology benefits all – not just vested interests. Risks managed proactively, enabling innovation to flourish. Politics transcending past biases and weaknesses. Amon Twyman, the Party Leader. The timescales spoken about for full electoral success – potentially up to 25 years – are far too far into the future, given all the other changes expected in the meantime. Q: What is the relation between Transpolitica and the various Transhumanist Parties? Transhumanist supporters who prefer not to associate closely with any one political party, but who have an interest in political action. Click here for more details, and to register to attend (while tickets are still available). I’ll be kicking off the proceedings, with a talk entitled “What prospects for better politics?”. Watch out for more news about the topics being covered by the other speakers. I am proposing that the IEET re-focus in a major way, on our website, with our blog, with our community, and in our work, on the explicit project of building a global technoprogressive ideological tendency to intervene in debates within futurism, academe and public policy. While we will remain a nonpartisan nonprofit organization, and will not be endorsing specific candidates, parties or pieces of legislation, we can focus on the broad parameters of the technoprogressive regulatory and legislative agenda to be pursued globally. Regarding a first concrete project in this new direction, I have in mind our editing a Technoprogressive Policy Briefing Book, comparable to the briefing books of think tanks like the Brookings Institution, AEI, or Heritage Foundation. This project can collect and collaborate with the excellent work done by Transpolitica and other technoprogressive groups and friends. Each policy briefing would state a general issue in a couple of paragraphs, outline the key technoprogressive policy ideas to address the issue, and then list key publications and links to organizations pursuing those policies. We will offer our donors and members a refund of the payments they have provided the Party within the last six months, in case they feel they no longer support our vision. On Saturday I had the pleasure to host Swiss futurist Gerd Leonhard at a London Futurists event in central London. The meetup was organised in conjunction with the publication of Gerd’s new book, “Technology vs. Humanity”. The subtitle of Gerd’s book indicates the emphasis that comes across loud and clear in its pages: “The coming clash between man and machine”. I have mixed feelings about that emphasis. Yes, a clash between humanity and technology is one of the possible scenarios ahead. But it’s by no means set in stone. If we are smart, much better futures lie ahead. These better future see a combination of the best of present-day humanity and the fruits of technological development, to create what I would call a Humanity+ future. In the Humanity+ future, technology is used to enhance humanity – making us healthier, kinder, smarter, wiser, more compassionate, and more engaged. In contrast, Gerd expects that technology will result in a downgrade of humanity. You’ll see that Gerd is an engaging, entertaining presenter, with some stunning visuals. Overall, I am happy to give two cheers to Gerd’s new book – two loud cheers. The first cheer is that it has many fine examples of the accelerating pace of change. For example, chapter three of his book reviews “ten megashifts”. Gerd starts his presentation with the bold claim that “Humanity will change more in the next 20 years than in the previous 300 years”. He may well be right. Related, Gerd makes a strong case that major change can sneak up on people “gradually and then suddenly”. That’s the nature of exponential change. The second cheer is even louder than the first one: I completely agree with Gerd that we need to carefully consider the pros and cons of adopting technology in greater areas of our lives. He has a brilliant slide in which human’s attitude towards a fast-improving piece of technology changes from “Magic” to “Manic” and then to “Toxic”. To avoid such progressions, Gerd recommends the formation of something akin to a “Humanity Protection Agency”, similar to the “Environmental Protection Agency” that constrains corporations from polluting and despoiling the environment. Gerd emphasises: just because it is possible to digitise aspects of our lives, it doesn’t mean we should digitise these aspects. More efficient doesn’t always mean better. More profit doesn’t always mean better. More experiences doesn’t always mean better – and so on. Instead of rushing ahead blindly, we need what Gerd calls “exponentially increased awareness”. He’s completely right. So I am ready to say, “Hip, hip…” – but I hold back from the third cheer (“hurrah”). Yes, the book can be a pleasure to read, with its clever turns of phrase and poignant examples. But to my mind, the advice in the book will make things unnecessarily hard for humanity – dangerously hard for humanity. That advice will unnecessarily handicap the “Team Human” which the book says it wants to support. The book has too limited a view of the positive potential of technology to address the key shortcomings in human nature. Let’s take these points one at a time. The book refers to human unpredictability, creativity, emotion, and so on, and insists that these aspects of human nature be protected at all costs. Even though machines might do the same tasks as humans, with greater predictability and less histrionics, it doesn’t mean we should hand these tasks over to machines. Thus far, I agree with the argument. But humans also from time to time manifest a host of destructive characteristics: short-sightedness, stupidity, vengefulness, tribalism, obstructiveness, spitefulness, and so on. It’s possible that these characteristics were, on the whole, useful to humanity in earlier, simpler stages of civilisation. But in present times, with powerful weaponry all around us, these characteristics threaten to plunge humanity into a new dark age. Indeed, despite huge efforts from people all over the globe, the planet is still headed for a potential devastating rise in temperature, due to runaway climate change. What’s preventing an adequate response to this risk is a combination of shortcomings in human society, human politics, human economics, and – not least – human nature. It’s a dangerous folly to overly romanticise human nature. We humans can, at times, be awful brutes. Our foibles aren’t just matters for bemusement. Our foibles should terrify us. For the vast majority of our 150,000 years or so on the planet, we lived in small, close-knit groups, working hard with primitive tools to scratch sufficient food and shelter from the land. Sometimes we competed with other small groups for limited resources. Thanks to evolution, we are supremely well adapted to that world, not only physically, but psychologically, socially and through our moral dispositions. Our moral shortcomings are preventing our political institutions from acting effectively. Enhancing our moral motivation would enable us to act better for distant people, future generations, and non-human animals. One method to achieve this enhancement is already practised in all societies: moral education. Al Gore, Friends of the Earth and Oxfam have already had success with campaigns vividly representing the problems our selfish actions are creating for others – others around the world and in the future. But there is another possibility emerging. Our knowledge of human biology – in particular of genetics and neurobiology – is beginning to enable us to directly affect the biological or physiological bases of human motivation, either through drugs, or through genetic selection or engineering, or by using external devices that affect the brain or the learning process. We could use these techniques to overcome the moral and psychological shortcomings that imperil the human species. This brings me to the second point where Gerd’s book misfires: its dogmatic dismissal of the possibility of technology to make any significant improvement in “soft” areas of human life, such as emotional intelligence, creativity, and intuition. The book asserts that whilst software might be able to mimic emotions, these emotions will have no real value. For example, no computer would be able to talk to a two year old human child, and hold its attention. This assessment demonstrates a major blindspot regarding the ways in which software can already provide strong assistance for people suffering from autism, self-doubt, early stage dementia, or other emotional or social deficits. As one example, consider a Guardian article from last year, “How robots are helping children with autism”. More is at stake [with IVF research] than in ordinary biomedical research or in experimenting with human subjects at risk of bodily harm. At stake is the idea of the humanness of our human life and the meaning of our embodiment, our sexual being, and our relation to ancestors and descendants. These comments by Kass have strong echoes to the themes developed by Gerd in Technology vs. Humanity. It turned out, contrary to Kass’s dire forecasts, that human society was more than capable of taking in its stride the opportunities provided by IVF technology. Numerous couples found great joy through that technology. Numerous wonderful children were brought into existence in that way. It ought to be the same, in due course, with the opportunities provided by technologies to enhance our emotional intelligence, our creativity, our intuition, our compassion, our sociability, and so on. Applied wisely and thoughtfully, these technologies will allow the full potential of humanity to be reached – rather than being sabotaged by our innate shortcomings. Emphatically, I’m not saying we should be rushing into anything. We need to approach the potential offered by these new technologies with great thoughtfulness. And with a more open mind than Gerd displays. Virtual travel technologies such as Facebook’s Oculus Rift, Samsung VR, and Microsoft’s HoloLens are just beginning to provide us with a very real feeling for what it would be like to raft the Amazon River or climb Mount Fuji. These are already very interesting experiences that will certainly change our way of experiencing reality, of communicating, of working, and of learning… [but] there is still a huge difference between these new ways to experience alternate realities and real life. Picture yourself standing in the middle of a crowded bazaar in Mumbai, India, for just two minutes. Then, compare the memories you would have accumulated in a very short time with those from a much longer but simulated experience using the most advanced systems available today or in the near future. The smells, the sounds and sights – all of these are a thousand times more intense than what even the most advanced gadgetry, fuelled by exponential gains, could ever hope to simulate. “A thousand times more intense”? More intense than what “the most advanced gadgetry could ever hope to simulate”? Ever?! I see these sweeping claims as an evidence of a closed mind. The advice from elsewhere in the book was better: “gradually, and then suddenly”. The intensity of the emotional experience from VR technology is likely to increase gradually, and then suddenly. I believe it would be utterly dehumanising and detrimental for a baby to be born in such a way. During his presentation at London Futurists, Gerd used labelled the technology of ectogenesis as “jerk tech”. In discussion in the Marlborough Arms pub after the meetup, several women attendees remarked that they thought only a man could take such a high-handed, dismissive approach to this technology. They emphasised that they were unsure whether they would personally want to take advantage of ectogenesis, but they thought the possibility should be kept open. Note: for a book that takes a much more thoughtful approach to the possibilities of using technology to transform genetic choice, I recommend “Babies by Design: The Ethics of Genetic Choice” by Ronald Green. …a way of thinking about the future that is based on the premise that the human species in its current form does not represent the end of our development but rather a comparatively early phase. Transhumanists view human nature as a work-in-progress, a half-baked beginning that we can learn to remold in desirable ways. Current humanity need not be the endpoint of evolution. Transhumanists hope that by responsible use of science, technology, and other rational means we shall eventually manage to become posthuman beings with vastly greater capacities than present human beings have. Transhumanism, with its lemming-like rush to the edge of the universe, represents the scariest of all present options. Where these criticisms have substance – so that transhumanists ought to pay attention. That article – like all other H+Pedia articles – is open for further contributions. Either edit the page directly. Or raise some comments on the associated “Discussion” page. The topics covered in Technology vs. Humanity have critical importance. A much greater proportion of humanity’s collective attention should be focused onto these topics. To that extent, I fully support Gerd’s call for an improved global conversation on the risks and opportunities of the forthcoming impact of accelerating technology. During that conversation, each of us will likely find some of our opinions changing, as we move beyond an initial “future shock” to a calmer, more informed reflection of the possibilities. We need to move beyond a breathless “gee whiz” and an anguished “oh this is awful”. The vision of an improved conversation about the future is what has led me to invest so much of my own time over the years in the London Futurists community. More recently, that same vision has led me to support the H+Pedia online wiki – a Humanity+ project to spread accurate, accessible, non-sensational information about transhumanism and futurism among the general public. H+Pedia welcomes constructive contributions from everyone interested in the future of humanity. By all means get involved! Team Human deserves your support. Team Human also deserves the best information, free of dogmatism, hype, insecurity, or commercial pressures. Critically, Team Human deserves not to be deprived of access to the smart transformational technology of the near future that can become the source of its greatest flourishing. History is replete with failed predictions. Sometimes pundits predict too much change. Sometimes they predict too little. Frequently they predict the wrong kinds of change. Even those forecasters who claim a good track record for themselves sometime turn out, on closer inspection, to have included lots of wiggle room in their predictions – lots of scope for creative reinterpretation of their earlier words. Helping businesses and organisations to think through some options for their future strategy, via “scenario analysis”. Organizations spend staggering amounts of time and money trying to predict the future, but no time or money measuring their accuracy or improving on their ability to do it. This bizarre state of affairs may be understandable, but it’s highly irresponsible, none the less. We can, and should, do better. In a highly uncertain, volatile world, our collective future depends on improving our ability to anticipate forthcoming developments. Mayyasi was referring to research by Philip Tetlock, a professor at the University of Pennsylvania. Over three decades, Tetlock has accumulated huge amounts of evidence about forecasting. His most recent book, co-authored with journalist Dan Gardner, is a highly readable summary of his research. The book is entitled “Superforecasting: The Art and Science of Prediction”. I wholeheartedly recommend it. A manual for thinking clearly in an uncertain world. Read it. Having just finished this book, I echo the praise it has gathered. The book is grounded in the field of geopolitical forecasting, but its content ranges far beyond that starting point. For example, the book can be viewed as one of the best descriptions of the scientific method – with its elevation of systematic, thoughtful doubt, and its search for ways to reduce uncertainty and eliminate bias. The book also provides a handy summary of all kinds of recent findings about human thinking methods. “Superforecasting” also covers the improvements in the field of medicine that followed from the adoption of evidence-based medicine (in the face, it should be remembered, of initial fierce hostility from the medical profession). Indeed, the book seeks to accelerate a similar evidence-based revolution in the fields of economic and political analysis. It even has hopes to reduce the level of hostility and rancour that tends to characterise political discussion. As such, I see the book as making an important contribution to the creation of a better sort of politics. Other research into decision-making, cognitive biases, and group dynamics. Forecasters and superforecasters from the Good Judgement Project submitted more than 10,000 predictions over four years in response to questions about the likelihood of specified outcomes happening within given timescales over the following 3-12 months. Forecasts addressed the fields of geopolitics and economics. A growth mindset, in which personal characteristics and skill are seen as capable of improvement, rather than being fixed. Throughout “Superforecasting”, the authors provide the human backgrounds of the forecasters whose results and methods feature in the book. The superforecasters have a wide variety of backgrounds and professional experience. What they have in common, however – and where they differ from the other contest participants, whose predictions were less stellar – is the set of characteristics given above. The book also discusses a number of well-known forecasters, and dissects the causes of their forecasting failures. This includes 9/11, the wars in Iraq, the Cuban Bay of Pigs fiasco, and many more. There’s much to learn from all these examples. We have created this widget to provide a rough view of how influential futurists are on the web and social media. It is not intended to be rigorous but it provides a fun and interesting insight into the online influence of leading futurists. The score is computed from the number of Twitter followers, the Alexa score of websites, and the general Klout metric. Yet another approach is to take a look at http://future.meetup.com/, the listing (by size) of the Meetup groups around the world that list “futurism” (or similar) as one of their interests. London Futurists, which I’ve been running (directly and indirectly) over the last seven years, features in third place on that list. Of course, we futurists vary in the kind of topics we are ready (and willing) to talk to audiences abound. In my own case, I wish to encourage audiences away from “slow-paced” futurism, towards serious consideration of the possibilities of radical changes happening within just a few decades. These changes include not just the ongoing transformation of nature, but the possible transformation of human nature. As such, I’m ready to introduce the topic of transhumanism, so that audiences become more aware of the arguments both for and against this philosophy. Within that particular subgrouping of futurist meetups, London Futurists ranks as a clear #1, as can be seen from http://transhumanism.meetup.com/. I haven’t had the time to view them yet, but if they’re anything like as good as the book “Superforecasting”, they’ll be well worth watching. 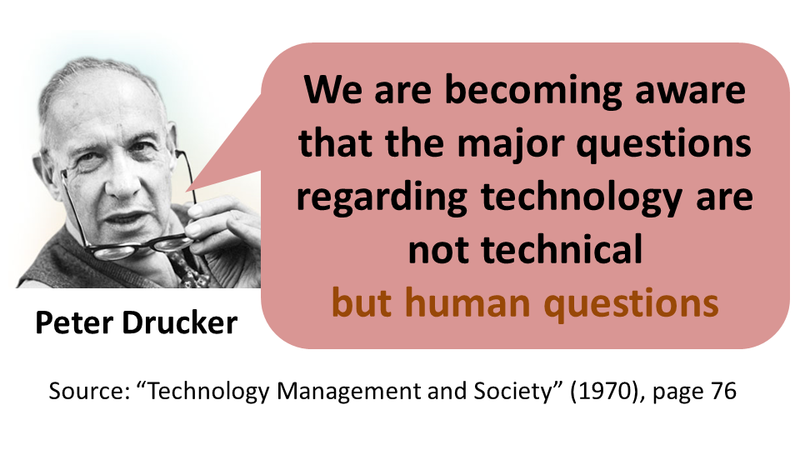 The major questions regarding technology are not technical but human questions. That insights sits alongside the observation that technology has been an immensely important driver of change in human history. The technologies of agriculture, steam, electricity, medicine, and information, to name only a few, have led to dramatic changes in the key metrics in human civilisation – metrics such as population, travel, consumption, and knowledge. But the best results of technology typically depend upon changes happening in parallel in human practice. Indeed, new general purpose technology sometimes initially results, not in an increase of productivity, but in an apparent decline. There were two previous slowdowns in productivity that were not anticipated, and caused great consternation – the adoption of electricity and the computer. The issues at hand with both were the protracted time it took to diffuse the technology, the problem of trying to utilize the new technology alongside the pre-existing technology, and the misconception that the new technology should be used in the same context as the older one. The good news, however, is substantial. In the two decades following the adoption of both electricity and the computer, significant acceleration of productivity was enjoyed. The secret was in the ability to change the context (in the case of the dynamo, taking pulleys down for example) assisting in a complete overhaul of the business process and environment, and the spawning of the new processes, tools and adjuncts that capitalized on the GPT. In other words, the new general purpose technologies yielded the best results, not when humans were trying to follow the same processes as before, but when new processes, organisational models, and culture were adopted. These changes took time to conceive and adopt. Indeed, the changes took not only time but wisdom. Robert Wachter’s excellent book “The Digital Doctor: Hope, Hype, and Harm at the Dawn of Medicine’s Computer Age” provides a dazzling analysis of the ways in which the computerisation of health records – creating so-called EHRs (Electronic Health Records) – is passing through a similar phase of disappointing accomplishment. EHRs are often associated with new kinds of errors, with additional workload burdens, and with interfering in the all-important human relationship between doctor and patient. They’re far from popular with healthcare professionals. Recognise and deal with the multiple complexities of the world of medicine. In today’s digital era, a modern hospital deemed the absence of an electronic medical record system to be a premier selling point. I interviewed Boeing’s top cockpit designers, who wouldn’t dream of green-lighting a new plane until they had spent thousands of hours watching pilots in simulators and on test flights. This principle of user-centered design is part of aviation’s DNA, yet has been woefully lacking in health care software design. Our iPhones and their digital brethren have made computerization look easy, which makes our experience with health care technology doubly disappointing. An important step is admitting that there is a problem, toning down the hype, and welcoming thoughtful criticism, rather than branding critics as Luddites. In my research, I found humility in a surprising place: the headquarters of I.B.M.’s Watson team, the people who built the computer that trounced the “Jeopardy!” champions. I asked the lead engineer of Watson’s health team, Eric Brown, what the equivalent of the “Jeopardy!” victory would be in medicine. I expected him to describe some kind of holographic physician, like the doctor on “Star Trek Voyager,” with Watson serving as the cognitive engine. His answer, however, reflected his deep respect for the unique challenges of health care. “It’ll be when we have a technology that physicians suddenly can’t live without,” he said. Smartphones will sell very well provided they allow users to build on, and do more of, the things that caused users to buy phones in the first place (communication and messaging, fashion and fun, and safety and connection) – and provided they allow users to do these things simply, even though the phones themselves are increasingly complex. As for smartphones, so also for healthcare technology: the interfaces need to protect users from the innumerable complications that lurk under the surface. The greater the underlying complexity, the greater the importance of smart interfaces. Health care, our most information-intensive industry, is plagued by demonstrably spotty quality, millions of errors and backbreaking costs. We will never make fundamental improvements in our system without the thoughtful use of technology. 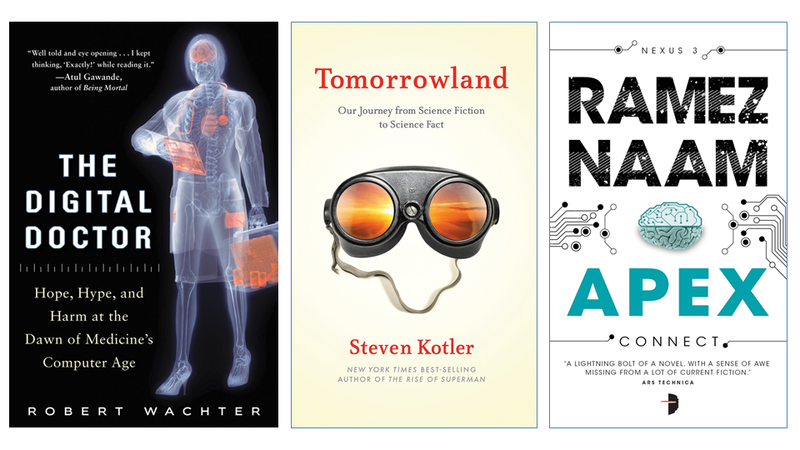 In a different way, Steven Kotler’s new book also brings human considerations to the forefront. The title of the book is “Tomorrowland: Our Journey from Science Fiction to Science Fact”. It’s full of remarkable human interest stories, that go far beyond simple cheer-leading for the potential of technological progress. I had the pleasure to help introduce Steven at a recent event in Campus London, which was co-organised by London Futurists and FutureSelf. Steven appeared by Skype. Ahead of the event, I had hoped to be able to finish reading his book, but because of other commitments I had only managed to read the first 25%. That was already enough to convince me that the book departed from any simple formula of techno-optimism. Options to prevent bio-terrorists from developing pathogens that are targeted at particular individuals. The preview is a bit breathless for my liking, but the book as a whole provides some wonderfully rounded explorations. The marvellous potential of new technology should, indeed, inspire awe. But that potential won’t be attained without some very clear thinking. The third of the disparate trio of three books I want to mention is, itself, the third in a continuous trilogy of fast-paced futurist fiction by Ramez Naam. In “Apex: Connect”, Naam brings to a climactic culmination the myriad chains of human and transhuman drama that started in “Nexus: Install” and ratcheted in “Crux: Upgrade”. Having been enthralled by the first two books in this trilogy, I was nervous about starting to listen to the third, since I realised it would likely absorb me for most of the next few days. I was right – but the absorption was worth it. There’s plenty of technology in this trilogy, which is set several decades in the future: enhanced bodies, enhanced minds, enhanced communications, enhanced artificial intelligence. Critically, there is plenty of human frailty too: people with cognitive biases, painful past experiences, unbalanced perspectives, undue loyalty to doubtful causes. Merely the fact of more powerful technology doesn’t automatically make people kinder as well as stronger, or wiser as well as smarter. Another reason I like Apex so much is because it embraces radical uncertainty. Will superintelligence be a force that enhances humanity, or destroys it? Are regulations for new technology an instrument of oppression, or a means to guide people to more trustworthy outcomes? Should backdoors be built into security mechanisms? How should humanity treat artificial general intelligence, to avoid that AGI reaching unpleasant conclusions? To my mind, too many commentators (in the real world) have pat answers to these questions. They’re too ready to assert that the facts of the matter are clear, and that the path to a better Tomorrowland is evident. But the drama that unfolds in Apex highlights rich ambiguities. These ambiguities require careful thought and wide appreciation. They also require human focus. In between my other projects, I’m trying to assemble some of the best thinking on the pros and cons of key futurist questions. My idea is to use the new site H+Pedia for that purpose. In some cases, I offer clear-cut conclusions. But in other cases, the balance of the argument is ambiguous. The future is far from being set in stone. I’ll welcome constructive contributions to H+Pedia from anyone interested in the future of humanity. It’s now less than three weeks to the Anticipating 2040 event, where many speakers will be touching on the themes outlined above. Here’s a 90 second preview of what attendees can expect.